By the early 1990's, District IV football had clearly established itself as one of the top football district within the state of Pennsylvania. The development of the highly successful District IV Football Prospect Camp, number of inductees into the PSFCA Hall of Fame, and competitive representation within the newly sanctioned district football state playoffs called for a need to look into forming a District IV Football Coaches Association. Pennsylvania Scholastic Football Coaches Association (PSFCA) District IV directors: Russ Manney, Wellsboro HS and Jim Bergen, Montoursville HS discussed the possibility of forming an association which would unite the coaches, promote local football talent, and make it possible to share information and concern with those on the state level. Coach Manney, director of the District IV Football Prospect Camp (present day Football Combine) felt the importance of maintaining and developing a system based on a foundation similar to the PSFCA. 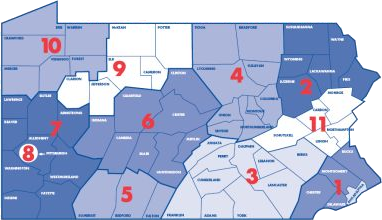 This would allow coaches in the three main regions of District IV: Northern Tier, West Branch (Susquehanna), and Coal Region (Southern) to work together sharing concerns, ideas, and understand each school district brings something important to the table no matter what league they represent. From their experiences while serving on the PSFCA board, both Bergen and Manney understood that there is more strength in numbers when promoting area athletes and coaches on the state level. In 1991 calls were made, letters sent and the first informal meeting of the District IV Football Coaches Association was held at Montoursville High School. Of the 32 teams represented in District IV, eleven head coaches showed up and represented all areas of the district. During the meeting many questions were asked, organization was discussed, and concerns were voiced. Tim Montgomery – Williamsport gave his view from the point of the districts largest school member. PSFCA Hall of Famer, Miller Moyer – Canton, expressed the view of one of the smallest schools within the district. The majority of coaches present represented the AA schools. Ray Raffin – Wyalusing, Jack Young – Towanda, and Ken Robbins – Loyalsock threw their support behind the formation of coaches association. The meeting lasted a little over two hours, but when it was adjourned the newly formed District IV Football Coaches Association was scheduled for their first official meeting. The first formal meeting of the association, officers were elected, Russ Manney – Wellsboro was elected as the first association president. Committees were formed to assist in the future development of the all-star game, combine, and development of growth. For the past 25 years, the District IV Football Coaches Association has grown strong and continues to develop ways to promote our player and coaches. Today the District IV Football Coaches Association holds one of the most successful high school combines in the state, the association produces a highly publicized "media day" just prior to the football season, and they work extensively with the Lions Club to raise funds designated for the purchase of eye glasses from proceeds of the annual District IV All-Star Game. It will continue to represent and promote the great sport of football in a positive manner throughout the state. Beginning this spring, you can follow the progress of the District IV Football Coaches Association and District IV football news via the association's new website developed and maintained by Ed Weaver - Circle W Sports. Ed is a former District IV athlete out of Wellsboro and began working with the District IV Football Coaches Association in 2014 as a statistician for the District IV High School Football Combine.